I know you want me to update my blogg... ok, then! Tomorrom mom and I are going to IKEA in Haparanda. It's gonna be lots of fun! Too bad you can't come,sis. Today I've been working at the café. I've got six dances to choreograph for the spring show. Problem is... I've got NO INSPIRATION! I'm really stressed out about this and I've started to panic. I can tell you this much: it's not helping at all! 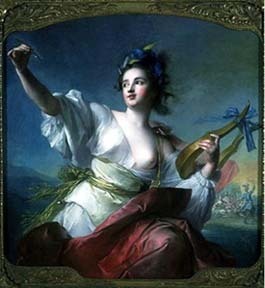 Terpsichore - muse of dance - help me! Today Mattias and i went snowboarding. It was lots of fun. I have'nt done it in the last NINE years! i really felt like a beginner again when we first started. But at the end of the day it went real good! We had real nice weather too. It was sunny all day. No clouds at all. Sweet! Today I had an alright day. Got up early, got back to bed because it was snowing too much! When Mattias got up around two, we took a walk downtown. Went to pick out some paint for our bathroom. i wnat to start painting right away, but we need to do some other things first. Like cleaning the apartment, fold clothes... and prepare the bathroom for it. i saw a dance performance. it was really nice. i wish i would've been in it. and i could've been.. only i felt like i didn't have the time. they've been working real hard and it looked good. and fun! tons of fun! much floorwork and also a lot of jumping. I love it! The sun's finally started to look through the clouds. Have I even seen it?